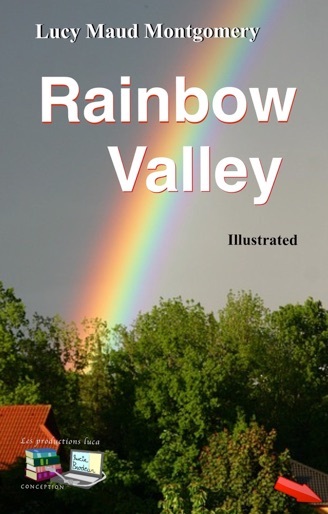 In Rainbow Valley, Anne and Gilbert Blythe have been maried for 15 years, and have six children (Jem, Walter, Nan, Di, Shirley and Rilla). The story centers around the Blythe family, the unrully Meredith children and their widower father. See what happened, you’ll love them ! Another Scandal and Another "Explanation"
"It's you manse young ones, I mean," said Mary. "It was just awful of you. I wouldn't have done such a thing for the world, and I weren't brought up in a manse, — weren't brought up anywhere — just come up." "Oh, don't pretend innocence," said Mary, witheringly. "Everybody knows what you've done." "I am grateful," retorted Mary. "You'd know it if you'd heard me standing up for Mr. Meredith through thick and thin. I've blistered my tongue talking for him this week. I've said again and again that he isn't to blame if his young ones did clean house on Sunday. He was away — and they knew better." "Of course it was," said Faith, with flashing eyes. "We went to Sunday School in spite of the rain — and no one came — not even Elder Abraham, for all his talk about fair-weather Christians." "It was Saturday it rained," said Mary. "Sunday was fine as silk. I wasn't at Sunday School because I had toothache, but every one else was and they saw all your stuff out on the lawn. And Elder Abraham and Mrs. Elder Abraham saw you shaking rugs in the graveyard." "Prayer meeting was Thursday night," cried Faith, "and Adam flew into the soup-pot on Friday when Aunt Martha's cat chased him, and spoiled our dinner; and Saturday there was a snake in the cellar and Carl caught it with a forked stick and carried it out, and Sunday it rained. So there!" "Prayer meeting was Wednesday night," said Mary. "Elder Baxter was to lead and he couldn't go Thursday night and it was changed to Wednesday. You were just a day out, Faith Meredith, and you did work on Sunday." "You can explain till you're black in the face," said Mary, "but a lie like that'll travel faster'n further than you ever will. I've seen more of the world than you and I know. Besides, there are plenty of folks won't believe it was a mistake."